To Skype or not to Skype? Piano lessons conducted over Skype have become increasingly popular. Skype is a free computer, tablet or phone app which can be either audio (phone calls) or video. The fact that it’s possible to call anyone, anywhere around the world at any time, opens up limitless possibilities for many professions, but particularly for music lessons. Whilst a considerable number of teachers have embraced this new technology, others feel remote lessons are less than desirable; how much can students really learn when not in the same room, or being demonstrated to at the same piano? I used to be amongst the skeptics, routinely refusing to give Skype lessons because I wasn’t convinced I could give a pupil the necessary attention and advice from behind a screen. Then one day an advanced pupil who I had been teaching for a couple of years (in real life!) suddenly moved to the US to go to university, and wanted to continue lessons (and exam preparation) with me. Would I give regular Skype lessons? Faced with this conundrum, I tentatively agreed. Indeed, it’s been an interesting experiment, and one with which I have been pleasantly surprised. Once we had decided on the best time (not easy when there is a substantial time difference), and the best position for the computer camera (as seen in the image above) so I can observe the keyboard, posture, fingers and hand positions, lessons commenced as usual. I sit at my piano with the laptop on the (collapsed) music desk, so I can play and demonstrate if necessary (and it usually is); it’s also vital to have all the intended scores or scales and exercises at your finger tips. Never have bar numbers, key changes, phrase structures and other ‘sign posts’ been so crucial. I still keep the proverbial pencil handy even though it’s unnecessary! 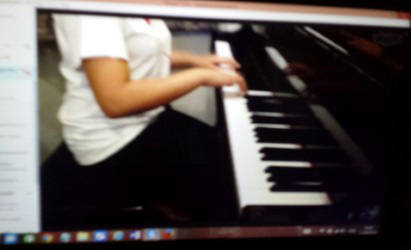 The assiduous Skype teacher will have a much more thorough set-up with multiple cameras, headphones, and the like, but it’s possible to obtain a fairly satisfactory result with just a computer and a piano. Sound quality varies; there can be a slight delay, especially when I talk whilst my pupil is still playing. At this point, the sound simply stops, meaning I will probably miss a few beats, so I have trained myself to keep quiet until the end, whether of a play through or a replay of a small passage. Rarely, the video and audio disintegrates and stops; this has never really affected our lessons; and if it does, the dissipated passage or phrase is just repeated. One aspect which concerned me, was the demonstrating of technique. I usually show students, and very often (with their permission), will correct them. This isn’t possible via Skype of course, although you can demonstrate by showing particular movements (it’s not the same as being at the same instrument though). This is never problem for my student because we have worked hard in this respect over the two-year period when she studied with me. But it could be an issue with a new student. Beginners would be a challenge too, as they generally rely on being guided around the keyboard. Sound production could be another problematic aspect. Hearing piano timbre via Skype isn’t the same as listening ‘live’ in the room, and can sometimes appear ‘harsh’ and ‘thin’ in quality, when in fact the opposite could be true (in the same way a difficult acoustic can alter our perception of sound). Again, having already taught the pupil in question, these issues are generally avoided, but could be alleviated by physical demonstration from a teacher (at the piano). In this instance, it would be especially helpful if a camera was set up to show movements. Here, I generally use my arm, wrist, hand and fingers to make the same gesture or motions in the air (to the camera), as would be required at the keyboard, which has worked thus far. I’m pleased to say my pupil is now well prepared for her exam and we’ve had few issues being thousands of miles away from each other. So perhaps this has convinced me to think again about the use of Skype for more than just business meetings! You want to study with a particular teacher, who resides far away from where you live. You have a limited amount of time and therefore perhaps cannot study regularly. You would prefer shorter sessions rather than one long lesson (although my lessons can be fairly lengthy). You want lessons in the comfort of your own home. You don’t want to travel and would like the lesson at a certain time of day, to accommodate your own busy schedule. Categories Uncategorized•Tags Learning to play the piano online, Skype Piano Lessons, Teaching Piano.